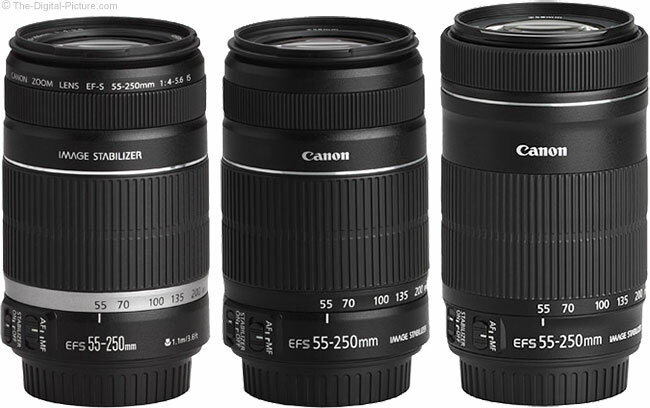 The Canon EF-S 55-250mm f/4-5.6 IS STM Lens is an inexpensive, light, entry level telephoto zoom lens that has image stabilization, very good image quality for the price and a very useful focal length range that will nicely complement most general purpose zoom lenses. It is a Canon "EF-S" lens, so the 55-250 IS STM lens is only compatible with APS-C format Canon EOS DSLR cameras including at this time the ultra-popular Rebel/***D/****D, **D (70D, 60D, 50D) and 7D models. 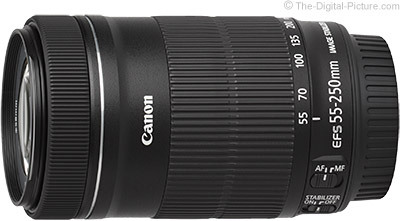 The 55-250 IS STM lens follows on the heels of the Canon EF-S 18-55mm f/3.5-5.6 IS STM Lens introduction and includes similar enhancements found in that lens. While the introduction of entry-level lenses does not bring great excitement to the photographic community, this lens, like the 18-55 STM, is a marked improvement over its predecessor. The predecessor in this case is the Canon EF-S 55-250mm f/4-5.6 IS II Lens which I will refer to as the "IS II" throughout this review. Standout improvements are image quality and STM (Stepping Motor) driven AF with no front element rotation and no extension with focusing. The most popular (because of least cost) general purpose kit lenses (lenses typically purchased in the same box as APS-C format DSLR cameras) have an upper end focal length of 55mm. The EF-S 55-250mm IS STM Lens obviously starts where these 18-55mm kit lenses end, leaving no gap and adding overlap only at 55mm (and not even 55mm if you look at the distances covered in actual test results). While gap and overlap are not usually a big deal, having every focal length covered at least sounds efficient. And regardless of gap and overlap, the nearly 5x 55-250mm FLR (Focal Length Range) is very useful. For those of us that think better in full frame angle of view equivalent, this lens delivers 88-400mm. For examples of this FLR, I take you to the university gridiron and to Dutchman Falls near Worlds End State Park. For the above examples, I attempted to set the focal lengths to the ones printed on the lens barrel (55mm, 70mm, 100mm, 135mm, 200mm & 250mm). I figured I misaligned zoom ring for the first set, but ... the second set's reported focal lengths exactly matched the first. This was not likely a coincidence – and doesn't really matter in real use as you seldom need to select a precise focal length for your shot. You select the proper perspective and framing and that focal length becomes the right one. The examples above should give you a good understanding of what to expect from the excellent FLR of this lens, a FLR that opens this lens up to a very wide range of uses. Wildlife, portraits, sports (under good light), air shows, a walk in the park, a hike in the mountains, a day at the beach and I could go on and on. And of course landscapes are included, but few lenses cannot be used for landscapes. However, telephoto lenses are often overlooked in a landscape lens selection. 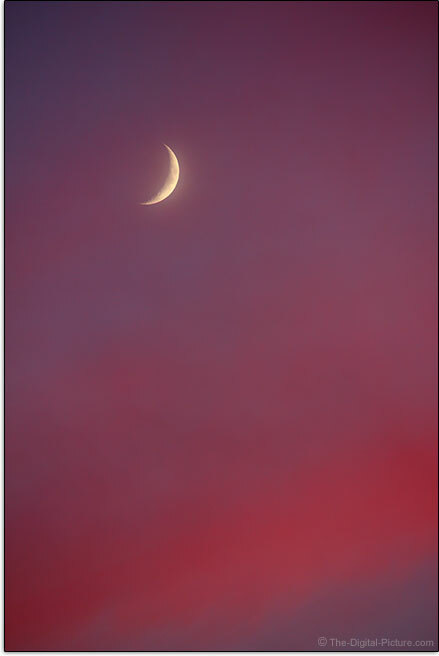 Great telephoto landscapes, with less background needed, are often very easy to capture. Or zoom to 250mm and aim high for a moon capture. Like most zoom telephoto lenses reaching beyond 200mm, this lens has a variable max aperture. While the overall max aperture range is shown in the product name (f/4-5.6), the max aperture step-down chart shows the full story. Ideally, larger focal length numbers are in the left-most columns of the chart, indicating wider apertures available at longer focal lengths. In this chart, we see that the 55-250 STM ranks near last place in terms of max aperture available at focal lengths. But, the difference is not dramatic with 1/3 stop of difference being, in general, the most shown. A fixed-max-aperture lens such as the Canon EF 70-200mm f/4L USM Lens has a significant aperture advantage at the long end of the FLR – 1 stop (twice as much light) in this case. Image stabilization adds significantly to a narrow aperture telephoto lens' usefulness. This lens is image stabilized and this feature sets it apart from Canon's other inexpensive telephoto zoom lens, the Canon EF 75-300mm f/4-5.6 III USM Lens. I find IS to be a huge advantage when handholding a lens. Helpful especially to movie audio recording is that this IS implementation is essentially silent. If you put your ear against the lens, you can hear some light clicking/humming, but you will seldom notice that IS is on – except in the viewfinder. The difference between properly framing a subject at a narrow angle of view (such as 250mm) with IS on and with IS off is like night and day. This results in less framing correction via cropping in post processing – which reduces image resolution and costs you time. You will notice the effects of image quality in your results. The 55-250 STM IS is rated for 3.5 stops vs. 3 stops for the IS II (which was originally rated at 4 stops before Canon adopted the CIPA standard). Because this lens is so light, I find it hard to hold rock still (an inertia issue) – and this effects my handheld image sharpness overall. The 3.5 stops rating falls between 1/13 and 1/15 second shutter speeds for me. At 1/15 second, most of my images are sharp. From 1/13 through 1/8, I'm still getting near or above 50% of my images sharp. With shutter speeds longer than 1/13, sharp result percentages drop off rapidly with a few keepers remaining at .3 and .4 seconds. My results in normal use were not nearly as good as my perfect scenario studio test results with 1/40 and 1/50 shutter speeds not adequate even at 55mm some of the time. At 250mm, hand shake is significantly magnified. And at 250mm, when asking for more than 3 stops of assistance from IS (1/50 second), results were mixed. But, I must have used perfect form at 1/20 second because I shot a string of 7 sharp images in a row. Again, in the field, I needed a significantly faster shutter speed for good results. 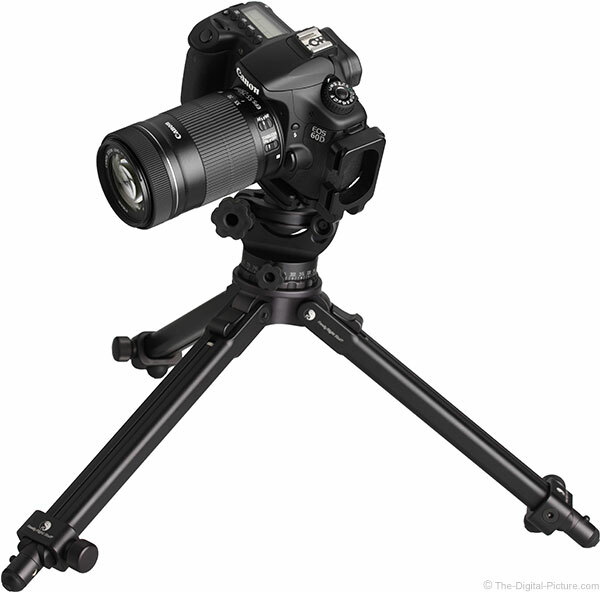 Image stabilization does not negate the need for a tripod in all situations and a tripod is always preferred when a situation permits use of such. Canon says that image stabilization should be turned off when using a tripod and their reason for this advice is to save battery power. While the battery consumption difference is generally of little regard to me, I can tell you that this lens frequently delivers very blurred images with IS enabled while tripod mounted. Also of concern is that the subject framing changes slightly when IS is active, leaving you with a potentially misaligned image. The manual recommends leaving IS enabled with monopod use. Image quality has easily been the biggest drawback for me to recommend Canon's 55-250mm lenses. These lenses just haven't been very good performers – especially at the upper end of the FLR. 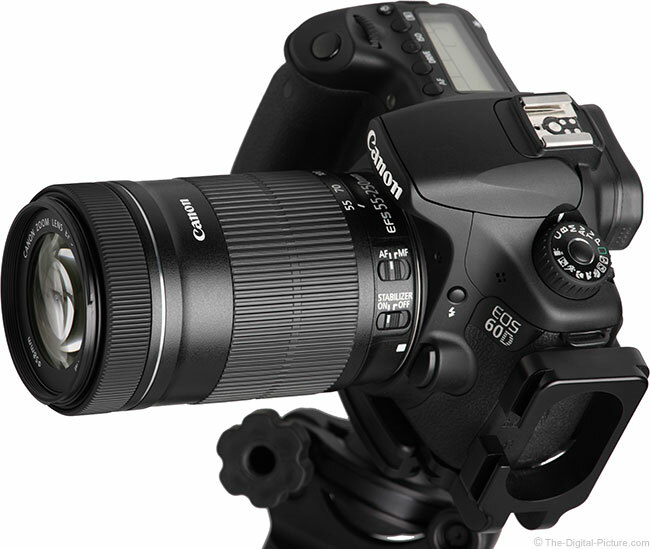 The Canon EF-S 55-250mm f/4-5.6 IS STM Lens changes things in this regard. With 15 lens elements in 12 groups, the IS STM has an obviously different optical design compared to the IS II's 12/10 design. And perhaps the most notable feature of this lens is the image quality it delivers. At apertures wider than f/5.6, expect mildly soft results from this lens (turning up the sharpness setting counters much of this). At f/5.6, image sharpness is quite good over the entire focal length range and across the entire frame, which also means that this lens is quite sharp at 200mm and above with a wide open f/5.6 aperture. Except at 100mm, I am seeing very little difference in f/8 image quality over what is delivered at f/5.6. The 100mm focal length is the weakest in this lens and improvement is still being seen at f/8 at 100mm. Using an aperture narrower than f/8 with most modern high megapixel (15+) APS-C format DSLRs results in increasingly soft results due to diffraction. This attribute is not unique to the 55-250 IS STM as all decent quality lenses mounted on these APS-C format cameras will show the same decrease in overall sharpness. I'm not saying that you should not use apertures narrower than f/8, but that you should be aware of the trade-offs for doing so. Use the site's image quality tool to see the difference for yourself. When we look at a comparison between the 55-250mm IS STM and the 55-250 IS II, the new lens is looking remarkable. The STM delivers significantly better image quality than the IS II from 135mm through 250mm – even when stopped down to f/8. The improvement can be seen in the center of the frame and the difference in the corners is dramatic. Surprisingly, my IS II performed even (noticeably) better than my IS I at longer focal lengths. See this difference in the image quality tool. With a narrow max aperture, getting good image quality wide open becomes especially important. This sharpness improvement is a big deal – this lens is delivering impressive image sharpness for the price. The parts of your image that are not sharp also matter and a blurred background is accomplishable with this lens, though primarily at the longer focal lengths. The quality of that background blur (bokeh) then becomes important. This lens has a rounded 7-blade aperture. 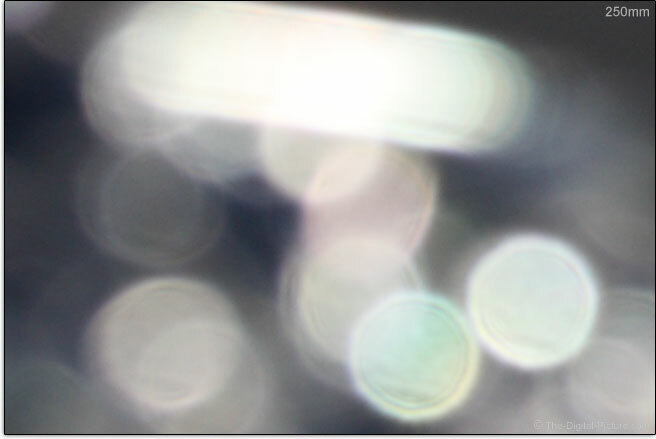 Here are some 100% examples of this blur with that aperture stopped down to f/8. While I have not encountered horrible bokeh overall with this lens, it is not the best performer in this regard. I primarily don't care for the bright concentric rings around the specular highlights in the examples above. The Canon EF-S 55-250mm f/4-5.6 IS STM Lens shows relatively little peripheral shading/vignetting. Expect about 1.6 stops in the corners at 55mm and about 1.2 stops over most of the balance of the FLR. Of course, APS-C format camera owners are used to seeing no noticeable shading from their full frame compatible lenses – even with wide open apertures. Stop down to f/8 and shading is negligible – basically gone. I've shot several panoramas with this lens at f/8 and have no trouble stitching the results without any vignetting correction. The above Susquehanna River panorama was captured handheld at 55mm in horizontal orientation using a circular polarizer filter. Photoshop was used to merge the multiple images. From a vignetting perspective, the STM IS performs very similar to the IS II. The biggest difference is that the STM has .2 stops less corner shading at 200mm. At 55mm, the 55-250 IS STM lens shows mild CA (Chromatic Aberration) in the corners. The amount of CA reduces until being very low at 100mm. CA again becomes noticeable at 135mm and becomes moderately strong from 200 through 250mm. You can see the CA in the 250mm test image below. There should be only black and white in this image (the color of the chart). All wavelengths of light are not being identically refracted, causing the color spill. While you should expect some flare from this lens when bright lights are in the frame, the amount of flare is not bad. Mild barrel distortion is present at 55mm. The transition to pincushion distortion happens at around 100mm where this lens is nearly distortion-free. The amount of pincushion distortion, even at 250mm, is rather mild. Overall, this lens has very good image quality. When the price is factored in, it becomes a very good deal. 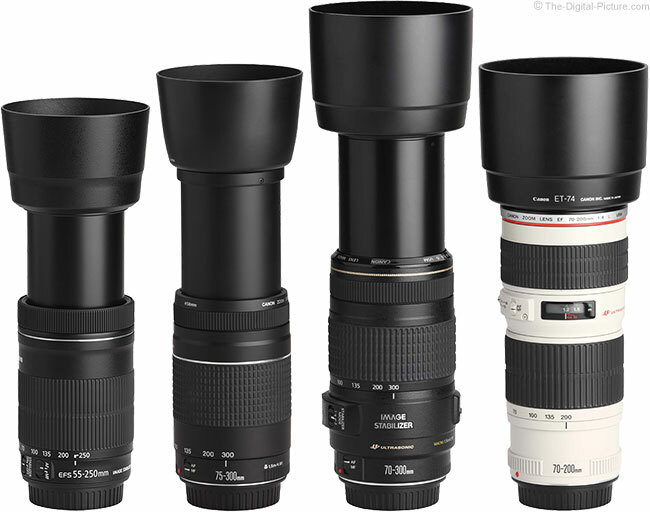 As the STM (Stepping Motor) AF system marches into entrenchment in the Canon lens lineup, the Canon EF-S 55-250mm f/4-5.6 IS STM Lens becomes the 6th EF lens (including two EF-M lenses) to receive this system. One of the biggest benefits of STM AF is quiet focusing. The IS II lens was very audible during AF, but while you can hear some light clicks and shuffling in the lens during AF if shooting in a very quiet venue, you will, most of the time, notice no noise during 55-250 STM AF. Focus speed is good under decent light levels, but initial focus acquisition was very slow on occasion. The biggest problem I encountered was when I wanted to quickly capture a shot (sports action for example) and either the lens was in a diffusely out of focus condition or doing a focus reset upon waking from sleep mode. If the subject is moving, the moment can be gone before focus is acquired. New with this lens is internal focusing. The IS II extended as it was adjusted toward MFD (Minimum Focus Distance). As you will see in comparison images later in this review, the IS STM is the same length as the IS II when it is fully focus-extended. I prefer the more-fixed-size design. Nice is that now a lens hood can be rotated into place without the lens barrel extension turning the focus motor gears to one extent or the other – to gain enough resistance for the hood to turn into (or out of) place. Even more important with the new design is that the front lens element does not rotate. If you've ever tried using circular polarizer filters on the IS II, you've experienced frustration. CPOL filters are rotated to dial in just the right amount of effect – an effect that can greatly enhance some photos. Any rotation of the filter changes the effect. A too-common scenario of CPOL filter use on the IS II was: Zoom, focus, adjust filter, push in too much on the end of the filter and inadvertently change focus, focus again, adjust filter, perhaps repeat. Then do the same again for the next shot if the focus distance changes. The new design allows the filter to be easily adjusted and it stays adjusted for use in similar-scenario (and orientation) follow-up shots. The difference is night and day for landscape photography. Smooth is a descriptor for the AF of all of Canon's STM lenses to date. The smooth focus capabilities of the STM AF system are, in part, directed toward video recording. Quick focus changes in a video come across sharply to the viewer and are best avoided. Some of Canon's latest DSLR models (EOS 70D, Rebel T5i, Rebel T4i, Rebel SL1 and EOS M at review time) have Movie Servo continuous AF mode and can most-utilize the smooth AF. Another feature desired for video is that subjects do not significantly change size as they go into and out of focus. 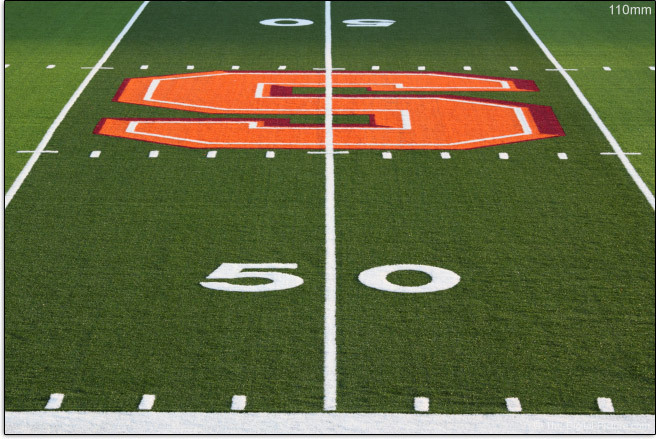 The 55-250 STM meets this requirement. FTM (Full Time Manual) focusing is available in AF mode, but this is not the standard Ring USM-type FTM you might be used to. The STM system is a focus-by-wire design that needs power from the camera to function. The key to using the 55-250 IS STM's FTM is that the shutter release must be pressed half way to enable manual focusing after autofocus lock. You can't just pick up the camera and manually focus this lens (unless the lens is set to manual focus-only mode via a switch and the camera is awake). The FTM feature was not present on the IS II. This lens is not parfocal. If you change focal lengths (zoom in or out), focus should (ideally) be re-obtained. You might not see much of an issue of zooming out at longer focus distances, especially with modest focal length changes. A full extent focal length increase in focal length is going to result in a blurry image. In the all-important focus accuracy department, I am seeing very good consistency. Focus accuracy is right on at the 250mm end of the FLR with slight backfocusing at 55mm on my 60D. Consistent back or front focusing can be dialed into perfection using Autofocus MicroAdjustment (if your DSLR has this feature), but unless your DSLR allows adjustments at both ends of the focal length range, you are left to chose one focal length or the other for adjustment. I did not encounter any meaningful issues using the lens without AFMA on the 60D. AI Servo AF (tracking an in-motion subject) is most-challenging to both cameras and lenses as adjustments are typically being made continuously and need to be completed immediately. 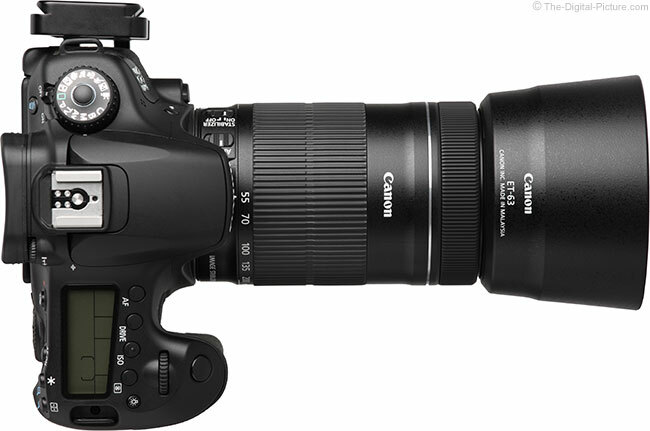 According to the Canon Press Release, the 55-250 STM has an improved AF algorithm. With a relatively narrow aperture on a small sensor format delivering relatively deep depth of field, accuracy requirements are not as critical with this lens. I canceled my first planned AI Servo testing session due to heavy cloud cover. I would have needed ISO 3200 to get a shutter speed fast enough to stop the action and ISO 3200 noise levels are high enough to mask the plane of sharp focus, negating the purpose of that testing. 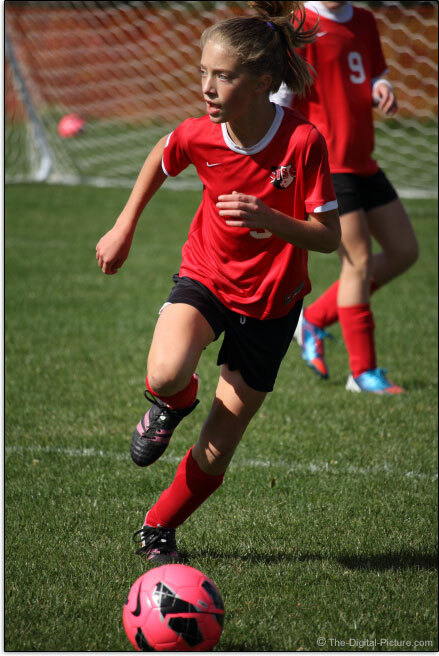 The next test plan was to shoot the warm up portion of a soccer game with the 55-250 STM. 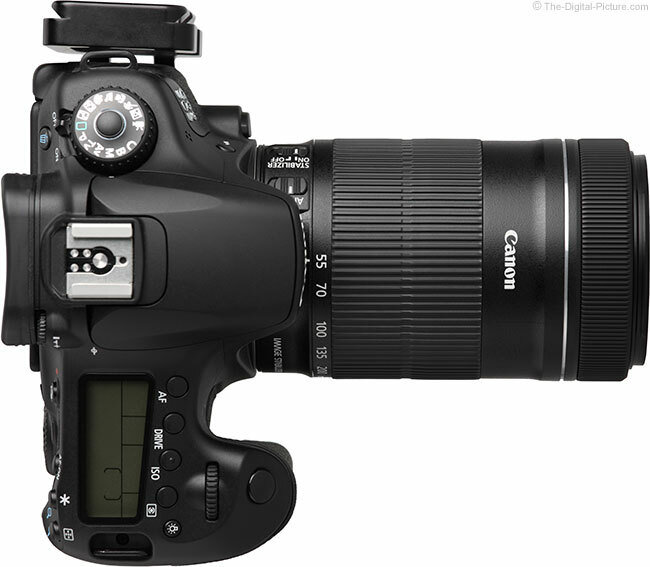 I would then shoot the rest of the game with a big white Canon L lens and a 1-Series body. The warm-ups were cut short, so I decided to just shoot the game with this lens. I expected a very low in-focus rate, but the game was not a critical one to me. Upon evaluating the shots, I was pleasantly surprised to find that the lens performed reasonably well. To be honest, I was surprised at how well it worked. Again, the deep depth of field makes it easier to keep the subject in focus, and that means the background does not get diffusely blurred. The action in the above picture is close – practically filling the vertical frame. And though the lens was set to 250mm and f/5.6 for the shallowest depth of field possible, the distant teammate and goal remain distractingly in-focus. But the image is properly focused and this lens costs FAR less than the preferred option. There will be a lot of "Soccer Moms" capturing shots of their kids' sports events with this lens. As mentioned, manual focusing is only available when this lens is mounted and the camera is powered on (and awake). The manual focus ring is smooth and easy to use. This lens has a manual focus trait that you need to be aware. Upon waking from sleep mode (or powered on), an AF reset will be performed. This means that, after careful manual focusing, the shot must be captured before the camera goes into sleep mode. For example, I had focused on a waterfall using tripod-based Live View manual focusing when someone stopped to talk. After chatting for a few minutes, I woke the camera to take the shot. The first thing I saw was the lens hunting for focus – even though I had the lens switched to MF mode. Make sure your camera does not enter sleep mode after manual focus is acquired with this lens. This is a bare-bones lens - there are no focus distance markings. With a relatively short 33.5" (1100mm) MFD (Minimum Focus Distance), the Canon EF-S 55-250mm f/4-5.6 IS STM Lens boasts best-in-class MM (Maximum Magnification) capabilities. While you can expect slightly lower image sharpness at these short distances, the magnification capability is very good and quite useful. This lens is not compatible with Canon Extenders. You can find third party extenders that will work, but ... the resulting image quality may or may not be acceptable to you. 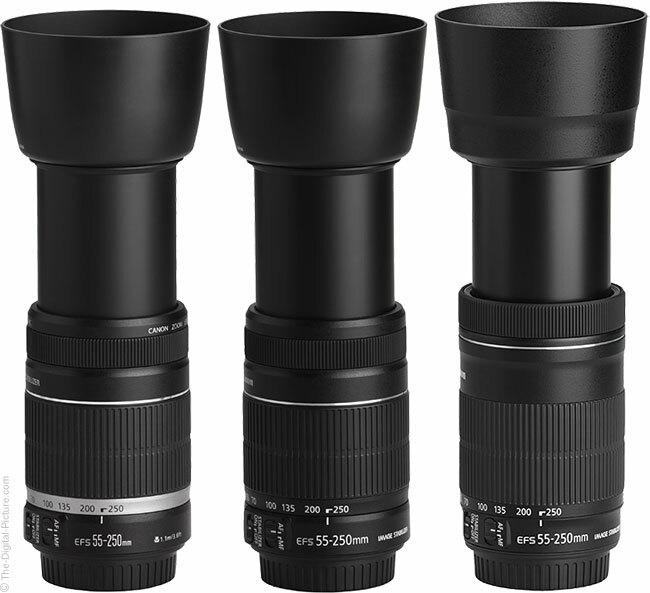 While they generally do not deliver the magnification increase that extenders/tele-converters deliver when mounted behind a telephoto lens, extension tubes are almost always telephoto lens compatible. Sporting a wide-for-a-telephoto zoom lens focal length of 55mm, this telephoto lens puts some nice extension tube magnification numbers on the chart. The with-Canon EF 12mm Extension Tube II magnification range spec is 0.38-0.05x and is 0.48-0.11x with the Canon EF 25mm Extension Tube II. The highest magnification is reached at 250mm with the 12mm ET, but 55mm gets the highest figure with the 25mm tube. Infinity focusing is typically lost when using extension tubes. When you buy an econo lens, you can expect some cost cutting to show in build quality and indeed it is visible in the Canon EF-S 55-250mm f/4-5.6 IS STM Lens. The first thing you do when installing this lens on a camera is remove the lens mount cap. And the first feature you will notice upon doing so is the plastic lens mount. Canon saves these for their lowest end lens models and this lens has one. The rest of the lens barrel is also, as expected, plastic. Even some of today's best lenses are plastic, so this is not a surprise. But (partially based on my experience with similarly built lenses) I'm not ready to trust this lens for critical applications – at least not without a backup readily available. The zoom ring consumes most of the barrel of this lens. This is a positive feature, making the zoom ring very easy to find and use. This ring smoothly travels its 75° rotation. As usual for a telephoto zoom lens with a greater-than-200mm focal length available, this lens extends significantly until 250mm is reached. No zoom lock is provided, but it is not needed with my test lens (the lock is commonly not needed with new lenses – only with well-broken-in lenses. Rotational pressure required to zoom the lens is sufficient to prevent gravity zooming, but not too much pressure that comfortable use is impeded. The focus ring, positioned in front of the zoom ring (my location preference), is smooth with no play. Again, an upgraded feature this lens gains is no extension with focusing as shown using the links under the above lens image. This lens is tight – there is basically no play or wobble. A welcomed bottom-of-the-chart feature you get with this lens is weight. This is Canon's lightest telephoto zoom lens – even slightly lighter than the IS II. 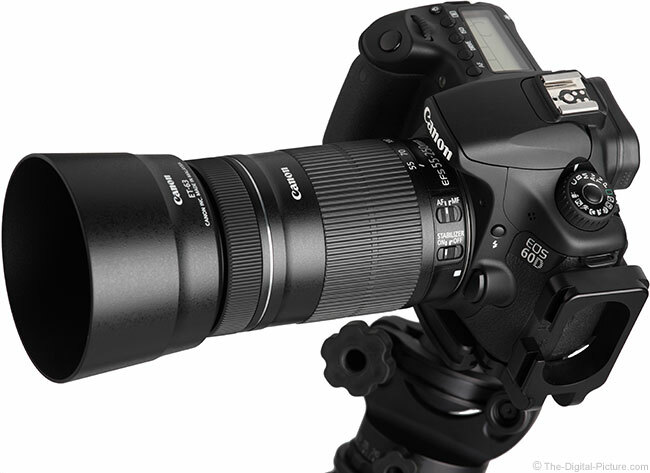 It weighs just over half as much as the Canon EF 70-300mm f/4-5.6 IS USM Lens. For many more comparisons, review the complete Canon EF-S 55-250mm f/4-5.6 IS STM Lens Specifications using the site's Lens Spec tool. While the light weight is a great feature for a lens you intend to carry for long periods of time, this lens is so light that, as I mentioned before, I find it relatively difficult to hold steady (an inertia issue). The light weight itself makes the lens feel cheaper than a heavier lens. Obviously the 55-250 STM is the smallest lens in this comparison. The other three lenses are full frame compatible, the other two black lenses reach out to 300mm and the L Lens has a fixed max f/4 aperture to its advantage. Interesting is that, even though it does not extend with focusing, the STM lens is still very slightly longer than the others when fully extended at 250mm. The older lenses are shorter at 250mm when focused to infinity. At review time, all three of these lenses can be found on retailer shelves with age relating to their price. To me, the STM version is well worth the price premium. The Canon ET-63 lens hood shown on the 55-250 STM above is optional – and, as usual for an optional Canon hood, seemingly expensive for what you get. This completely plastic lens hood (matte plastic interior – no frocking) gains a small bevel and a new, more luxurious finish. The hood adds significant protection to the front element from bright light, impact and dust/rain. Of course, this is not a weather sealed lens, so be sure to keep it covered during wet use. New with the STM is the Canon Lens Cap II with the long-needed center-pinch feature. Installing and removing the lens cap with the hood in place is no longer a problem. No case is included with this lens. The 55-250 IS STM's 58mm filter size is relatively small, inexpensive and common. And light. 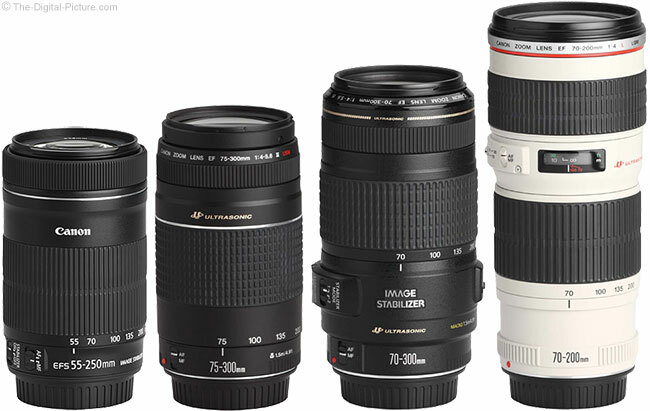 For alternatives to this lens, consider the lenses listed in the Canon telephoto lens recommendations. After using this lens a healthy amount including on a couple of short-duration trips in addition to locally, I have to admit that keeping this lens in my kit has been a consideration for me. The results it delivers are quite good. The 55-250 IS STM is a very good option for those times when traveling light is very highly desirable including trail running, hiking, traveling, etc. For a light price, you get a light lens with a useful telephoto zoom focal length range, a compact design, quiet operation, image stabilization, good AF performance and impressive image quality at a value price point.